This post is a continuation of another recent post (Early IF transformers). Instead of hijacking the original posters thread, I decided to start a new thread. This is a chance for anyone to post a photo or two of their favorite 20s superhet. Dale wanted some info on Raven superhets, so I'll start there. The first photos are of a 12-tube Raven superhet that I used to own in the mid 1980s. It was about 40 inches long and it had a beautiful engraved panel with the Raven logo. It had been modified in a few places, and it was missing a few parts. Most of the supers that you run across will probably have a few problems. Notice that this superhet had Three main tuning dials. A collector who specialized in Raven radios was advertising that he wanted examples of these sets, so I sold it to him. If I had the chance now, I would probably trade any two of my present supers to get this one back! Here are a few photos of a Raven that was on eBay in January 2007. It's a fairly nice set, with Two main tuning dials. Here are a few photos of a Raven that was on eBay in May 2007. It's a fixer-upper, but most of the good parts are there. This looks like a Three dial superhet but it only has two main tuning dials (the large dial on the left is a stability control). And finally, here are a few photos of a Raven that was on eBay in November 2008. This is a really nice set and it has some type of factory hard rubber panel, with the Raven logo. 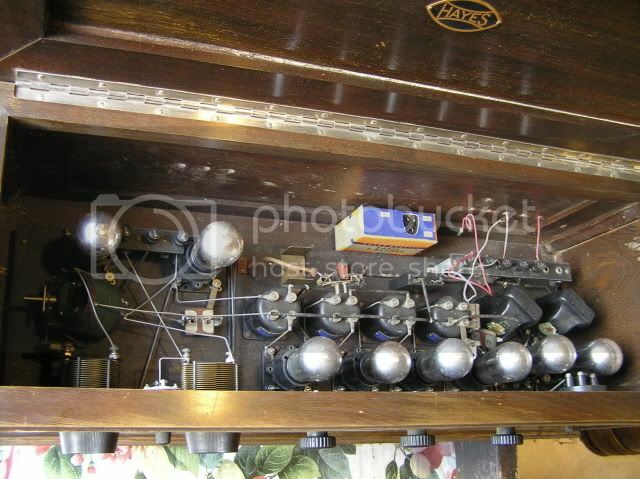 This again looks like it has three main tuning dials but the large control on the right is for stability. Now it's your turn. Let's see some of those Roaring 20s supers! Last edited by Duane B on Feb Mon 19, 2018 2:38 am, edited 1 time in total. I really like supers, especially those called Leutz. OH My Lord - - be still my beating heart. The Ravens are beautiful Duane. I'm still in awe of the 12 toober. I didn't even know such a Raven version was offered. I wonder if anyone has documentation on the twelve tube Raven? I hope the unbuilt Raven kit I have will look something like your second set pictured, or maybe the last one. I have a choice of several cabinets but haven't yet figured out which one I want to use. I practically wet my pants every time I visit Ron's web site and collection - - - the kind of collection the rest of us aspire to. Tony, that is a neat portable - - and other than Silver Marshall and maybe one or two other companies, not many folks tried to shoehorn these sets into a portable format. The guy who did it, did good. Congratulations all on some beautiful examples of this little seen or collected corner of early radio. I'll contribute one of my more unusual sets - - most folks here may have already seen the pictures but for those who have not, I'll give em another go. The set is named "OTTACRAT" and to date I have not been able to find out who built it or where. So far the OTTACRAT remains a mystery concerning who built it or where - - - there have been some pretty good guesses so far, but nothing concrete to point to its heritage. I'm hoping some of the forum's member will take time to post in this thread. I know of a number of them who have very interesting early Superhets in their collections. Joe Cro needs to check in here with the incredible copper-lined early Super he is currently working on - - it's to die for. That's a nice looking set Tony! It looks like a Remler, but the oscillator coil doesn't look quite like a Remler. Do the IF transformers happen to have "Selectone" nameplates? If so, it's an early Scott superhet. Either way it's a very nice set. You don't see them very often when they include the works - radio, batteries, loop antenna, and speaker. Thanks for posting the photos. It looks like a Remler, but the oscillator coil doesn't look quite like a Remler. Maybe it's my imagination, but the oscillator coil looks a tad fat for Scott, at least from the perspective shown - - - could be whoever built the set substituted for the usual "Thor" unit. Wcirco, when you do a quote its very easy to delete text that is not pertinent or pictures that have already been posted so that they don't show again. BTW, Dale, thanks for all the great pictures. I love them! I have posted this one on the forum before, but I thought I would add it to this thread. It is a Remler 'Best' 8 tube homebrew superhet built in a Hayes cabinet. I am not a big battery set collector, but this one is a bit special because I purchased it from the family of the original owner and builder. They found it in the rafters of their grandpa's garage after he passed. I considered myself lucky to get it. I have not taken the time to get this one running, but all the 01A's are good, so once I construct a power supply, I think it should come up OK. I still need to construct a loop to go with this set. Does anybody know if I should be looking for a horn speaker to go with this set? I do have an RCA 100A speaker. Would that be correct for this set? I have a Remler similar to yours and with all this talk of Superhets lately I fired it up a couple days ago. I'm using a 100A speaker and it works fine. For a PS you can get by with 45V +B and then three C batteries two 4.5V and one 1.5V and of course the 2A 5 or 6 V A supply. I hope you get yours going, I'd like to compare notes on performance etc. I'll try and post some pix later. be correct for the vintage of the set. A horn speaker is what you need. I'm pretty sure it is homebrew. I will have to drag it out to see what is on the IF transformers as I have not opened it up for more than a year. Both audio transformers were open and the speaker was open. I replaced the transformers (keeping the original frames) with substitutes from AES. The shells would not fit over the new cores so I have them saved. maybe I can find something better at some point so that I can put the original shells back on them. I rewound the speaker with not-enough wire, but wire I could see, and I can hear it again. Not real loud but it plays. I was able to "rejuvenate" the bias batteries by unfolding the cover at the bottom and drilling into the zinc cans and injecting some water. I had to use a power supply for the rest just to get it playing. The tube sockets are the spring loaded ones that tend to have problems. I managed to tweak these so that everything worked. There was some marginal soldering that I had to take care of as well. I seem to remember that I had some pictures of the innards somewhere. Let me see if I can find them. Odd tubes. I was expecting globes these look cylindrical. What are these? What they said - - and maybe a UX-120 as well. Hey guys I just want to say thanks to all for sharing these great pictures. I especially like the Raven's and Dale's oddball "OTTACRAT". Tony's homebrew portable is really cool with that loop antenna built in; the perfect set to take to the beach . It's the rare and super cool early sets like these that make me almost regret narrowing my collection down to AC sets from the very late 20's and up. I was able to see the IF transformer label with a dental mirror. They say REMLER with a blue label. The Oscillator coil is unmarked except for pin numbers on the terminals. The tuning caps have gold plates with a texture in the metal and are the butterfly type. Since the Remler and Scott Selectone IF tranformers are so much alike in appearance, has anyone ever figured out if it was a case of form following function? Purloining a proven design? One firm purchasing housings from the other? A common Bakelite supplier - - - hence a "stock" or off-the-shelf housing used? Someone had eyes inside the other guy's R&D section? Just curious. I've thought about it off and on for a while but don't think I've ever seen the similarities in appearance addressed. 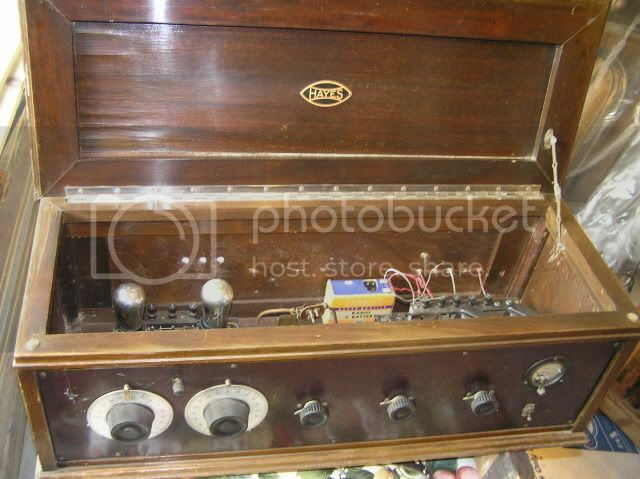 The first Scott radios did use Remler transformers. Scott must have liked their looks, so he copied them when he made his own transformers. Just a thought. The transformers look very much the same, but their electrical characteristics are a little different. The frequency of a Remler transformer is 45 kc. Instead of going up in frequency, with improved designs over time, like the gradual trend was, Scott actually went down in frequency. The frequency of the R-400 and R-410 transformers is 35 kc. I've plotted the bandwidth and relative gains of the Remlers and Scotts. The respective filter transformers, 610 and R-410, are nearly identical (4 kc bandwidth and 8 gain). The respective IF transformer, 600 and R-400, are a little different (70 kc bandwidth and 13 gain for the 610, and 40 kc bandwidth and 8 gain for the R-400). Scotts had a little bit narrower bandwidth than the Remlers, and they were probably matched closer at the Scott factory. Other than that, they're pretty much the same.